Hollywood's Rising Star | New Growth Hair Magazine | We capture the culture of urban barbershops and beauty salons. When Imani Hakim was seven years old, she felt destined to become an actress. While other little girls were playing dress up, Imani was writing short movie scripts and plays. She was the director and her cousins starred in her childhood productions. After getting enough practice at home, Imani’s father encouraged her to participate in plays at her local neighborhood theater. Four years later, Imani landed her big break as Tonya Rock on Everybody Hates Chris. Imani could relate to Tonya because she has five brothers and two of her older brothers were very similar to her brothers on set. Last year, Imani starred as Olympic Gold Medalist Gabby Douglas in The Gabby Douglas Story. Recently, Imani wrapped up filming her first romantic lead role in an upcoming movie entitled Chocolate City which will be in theaters on May 22, 2015. She will be acting alongside Robert Ri’chard, Michael Jai White, Vivica A Fox, Carmen Electra, Tyson Beckford, and Ginuwine. Earlier this year, Imani was named the spokesperson for Hair Envy International, a new hair line. 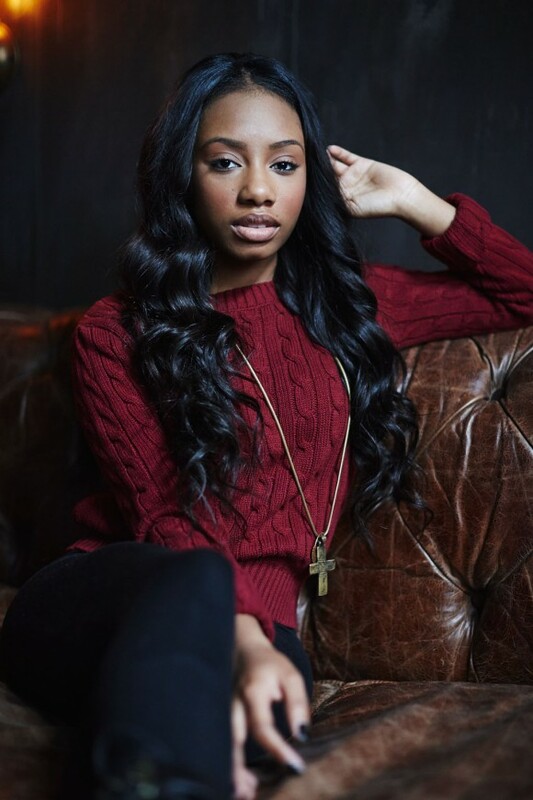 Below is my interview with Imani Hakim, one of Hollywood’s rising stars. Phillips: How did you get your break on Everybody Hates Chris? Hakim: My dad and I traveled from Cleveland to Los Angeles for pilot season, which is the best time to get an opportunity to audition for new television shows. After about two months, we connected with my manager and she got me the audition for Everybody Hates Chris. After the audition, I was excited to get a call back. Then I did the screen test and I booked it. But I need to let your readers know that it wasn’t an easy path. Right before I booked the show, my Dad and I ran out of money. We were living out of our van, eating off The Dollar Menu every day, and bathing in Starbucks bathrooms. Back then, I was only 11 years old, and my dad noticed that something was different with his little girl. He could tell that I was getting a little down and homesick. Like it was yesterday, I can remember my dad looking me in the eye and saying “We can pack up and go back to Cleveland whenever you are ready but I am willing to stay here as long as it takes to help you pursue your dream.” It sounds weird saying this now, but I told my dad that we didn’t come all this way for nothing so let’s keep going. Looking back on it, I think I booked Everybody Hates Chris because we didn’t give up. Phillips: Tell us about your experience playing the role of Gabby Douglas? Hakim: It was a new experience because I never played an actual person before. It was definitely a cool experience but at the same time the role was very challenging. I really had to do my homework to learn about Gabby Douglas, her family, and the adversities that they faced along the way. Gabby’s story was very inspiring and I walked away from the role with a greater appreciation for her accomplishments. What I found ironic is that she and I both lived out of our cars on our quest to meet our goals. And when we met, it was an instant connection between us. I was fortunate to have Gabby on set to give me input to make sure that I was properly representing her on film. I am grateful that I had the opportunity to participate in the Gabby Douglas project because it forced me to move outside of my comfort zone. I look forward to other opportunities that help me to develop my acting skills. Phillips: What were your thoughts regarding the public debate about Gabby Douglas’s hair? Hakim: As a community, sometime we make issues bigger than they should be. We had a young African-American going after her dream and reaching for something much bigger than her hairstyle. I wasn’t sure if the director was going to include the issue about some people being critical of Gabby’s hair in the movie. I’m glad that it wasn’t included in the movie because her story was so much bigger than her hairstyle. When I was in character as Gabby Douglas, I wasn’t thinking about my hair, I was thinking about winning. It’s unfortunate that people couldn’t just be happy for Gabby and cheer her on as opposed to trying to find something wrong with her hair. Gabby’s hair is fine now and was fine then. At the end of the day, Gabby is an Olympic Gold Medalist and an inspiration to millions of young girls. Phillips: You are playing your first romantic lead in Chocolate City? Please tell us what we can expect from you in this film. Hakim: I was nervous when I initially met with the director about the role. I was still nervous after I booked the role. I was so nervous throughout the whole process. My whole career I’ve played roles much younger than my actual age. So this is the first time that I’m playing a character that’s my age. In Chocolate City, I had my first on-screen kiss and my emotions were all over the place. Even though I felt like I had experience kissing in real-life, on-screen is totally different. Robert Ri’chard was great to work with and I’m excited to see how everyone reacts to me after seeing Chocolate City. After watching myself on camera, I said to myself “I’m not a kid anymore.” So when people go to see Chocolate City, don’t expect to see Tonya Rock. Phillips: Does Imani have time to date? If so, what kind of guy would catch your attention? Hakim: Right now, I date from time to time. Being so young and on the path that I have chosen, it’s a little more difficult to find someone where we share a mutual attraction. I’m young but I’m absolutely focused and my life is a little bit different than other people my age. The guy that would catch my attention would be just as ambitious, goal oriented, focused, and determined as me. My ideal relationship would be one where we could can come together to motivate and uplift each other. I haven’t found that just yet but who knows what the future holds.